This is the new president-elect of Argentina. Well, the other woman on the picture, that is. Cristina Fernández de Kirchner, noted for her wardrobe and shoe collection, will hopefully perform, as my good friend, Georgie, originally an Argentine, put is, as well as she looks. Fernández started her political career in the Peronist Youth movement of the Justicialist Party in the 1970s. 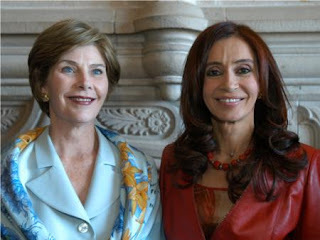 She married Néstor Kirschner - the current Argentine president - while at Law School and both practiced law in Río Gallegos. Cristina Fernández espouses a kind of combative speech reminiscent of Eva Perón, some say. I bet today she is singing: "Don't cry for me, Argentina!" A fun-dressed person with shiny hair demands presence, darn it. I quite like that leather jacket. Right. I bet she didn't buy it at Macy's. Methinks, she raided Eva Peron's closet.